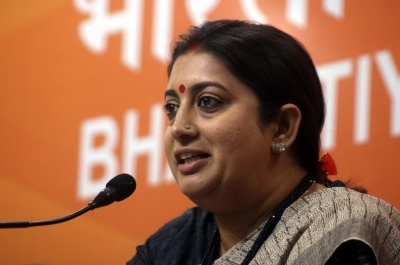 New Delhi Sep 14 (IANS) Akhil Bharatiya Vidyarthi Parishad (ABVP) wrenched three out of four seats including that of the President in Delhi University Students Union (DUSU) polls the results of which were announced late on Thursday. ABVP s Presidential candidate Ankiv Basoya from the Department of Buddhist Studies defeated Sunny Chhillar of Shivaji College hailing from Congress-affiliated National Students Union of India (NSUI) by a margin of 1 724 votes. A total of 20 467 votes were polled for Basoya while Chhillar trailed behind at 18 743 votes. Shakti Singh of ABVP defeated the closest candidate Leena of NSUI -- who also happened to be the only Dalit candidate in the fray -- by a wide margin of 7 673 for the post of Vice-President. The lone saving grace for NSUI was its Secretary post candidate Akash Chaudhary who defeated ABVP s Sudhir Dedha by a margin of over six thousand votes. ABVP s Jyoti Chaudhary grabbed the post of Joint Secretary defeating NSUI s Saurabh Yadav the closest second by difference of just under five thousand votes. The CYSS-AISA alliance failed to ruffle many feathers in its first outing together. It s Presidential candidate -- fielded by CYSS which is affiliated with Aam Aadmi Party -- managed to get about eight thousand votes less than half of first runner up s tally. 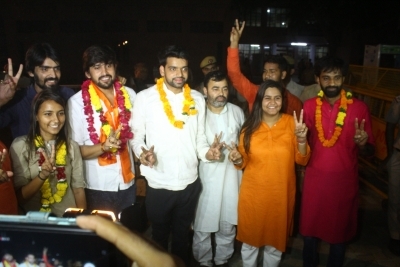 While the counting remained suspended for over four hours the CYSS-AISA and ABVP raised slogans demanding the resumption of the counting process which could only be done after 6 p.m.
"Apprehensions about EVM tampering are only valid when the victory margin is huge while this is the not the case here where vote gap is fairly close " the Joint Secretary elect Jyoti Chaudhary told reporters after her win was announced. "AISA-CYSS alliance was forged at the very last moment and we couldn t convert the immense support we received into votes. Yet the way we fought this election has given a new dimension to students politics in DU. "We demand a high-level judicial enquiry in the poll mismanagement and EVM malfunctioning " CYSS-AISA said in a statement after result.